Seeing Back to School stuff in the shops before the school year has even finished has always been a pet hate of mine. 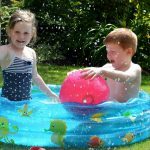 It’s the teacher in me – I don’t want to wish away my school holidays before they’ve even started! 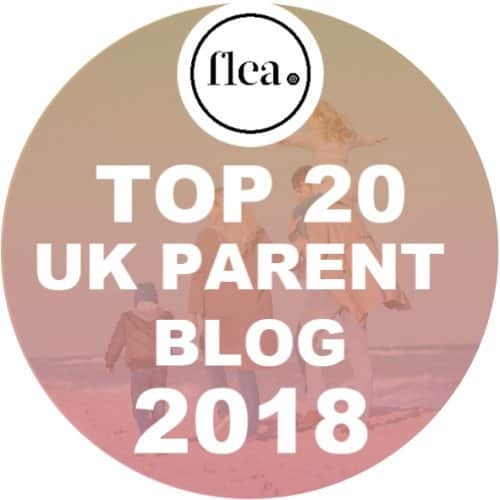 However as a parent I now understand the need to be a bit organised on this one – for a start there can be a lot of stuff to buy so it makes sense to spread the cost where you can. 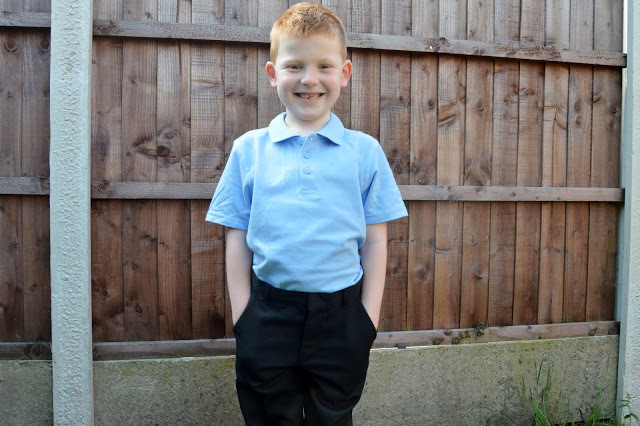 I got caught out a couple of years ago when I decided to leave buying Ben’s school trousers till the end of August, mainly for fear that I’d buy them and he’d have a growth spurt. As it turned out I ended up not being able to get the slim fit trousers he needed and he went back to school virtually swimming in a cheap pair of supermarket trousers. They were poor quality and quickly looked worn and tired. Last year I was much more organise and got my order in for his slim fit trousers much earlier on! 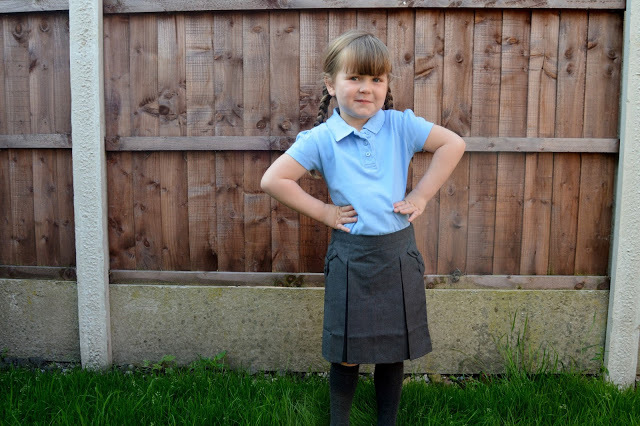 So here we are, in the very first week of the school holidays and I’m writing about school uniform. This is because I’ve just taken delivery of all the bits and pieces I needed to complete Ben and Chloe’s uniforms for the new school year. 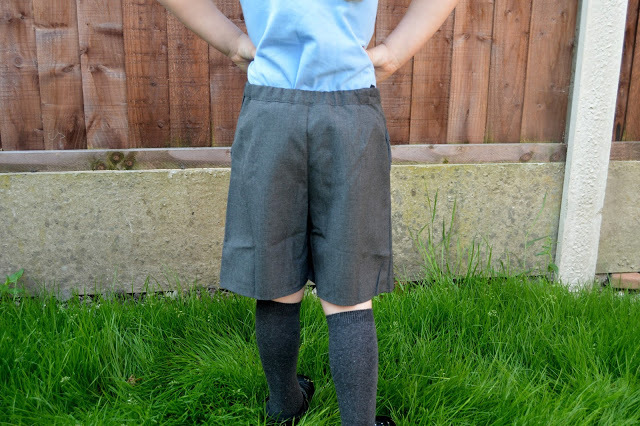 Luckily neither of them needs an entire new uniform but there was still a significant list, so I was thrilled when the guys at George at Asda jumped in and offered us the opportunity to sample their wide back to school range. 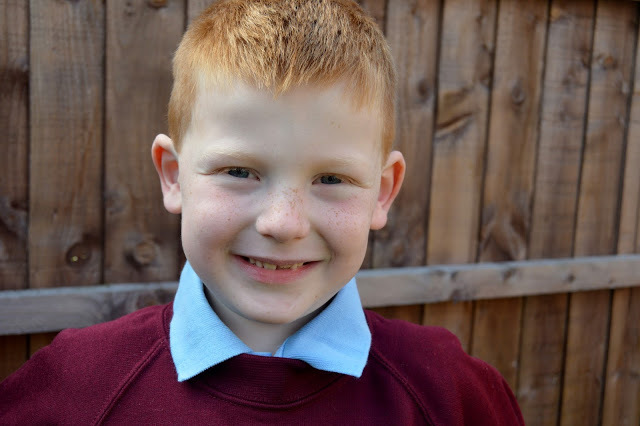 Ben and Chloe’s school has a badged jumper / cardigan so they have been purchased directly from school. I can’t complain too much as Ben has made his last two last him for three years and Chloe has plenty of room in hers for September. I was pleased to see that should it have been necessary there was a range of burgundy jumpers and cardigans on the Asda website. Although Ben’s current school trousers are quite a good fit (having been replaced in the Spring after he shot up again) he still needed some new ones. Yes he’s the boy that managed to put a big hole in the knee skidding across the playground. I fear he will always be that boy and I shall just have to accept the regular repair and replacement of school uniform! 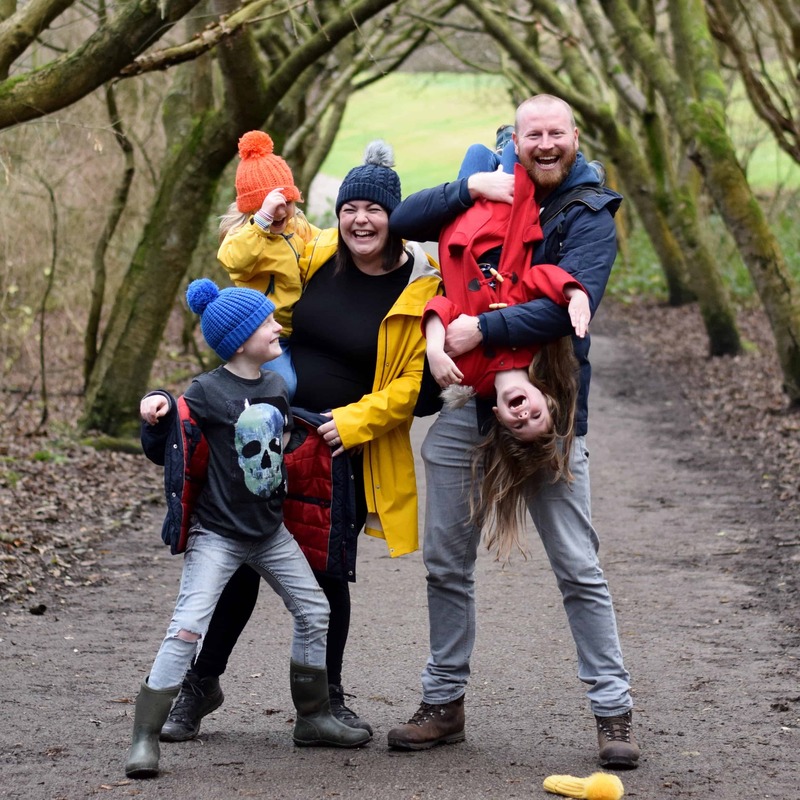 I’ve ordered two pairs of slim fit charcoal trousers – he’s a right skinny monkey so always has slim fit trousers and needs an adjustable waistband – luckily these trousers provide both. I ordered him age 6-7 and I would say they’re true to size, they’re pretty big on Ben right now. With their Teflon coating I’m hoping they might resist the odd spillage of school dinner, paint or even a skid across the playground. 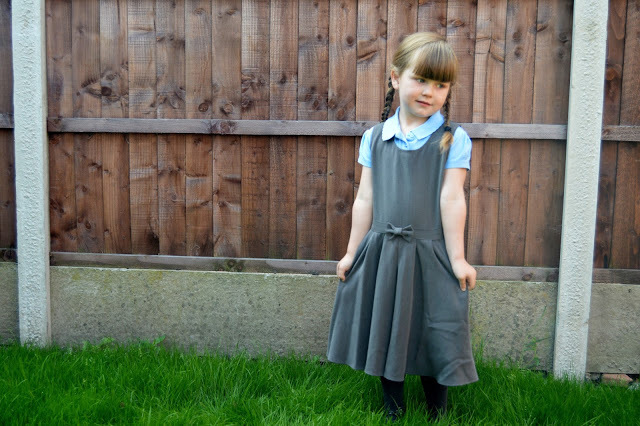 Chloe’s skirts and dress from last year have all washed and worn really well and in all honesty will do her well into the coming year however she will be at school for full days now so will need more uniform to accommodate for this (particularly as she’ll be having her dinner at school!) 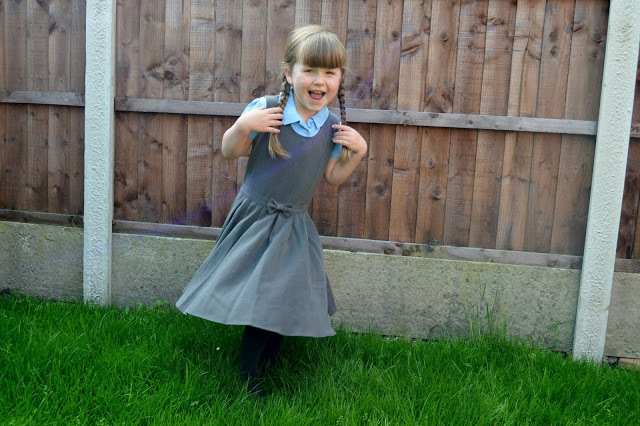 Chlo is something of a girlie girl and does love a dress however she got frustrated with her pinafore last year and said the straps tended to fall down when she was running. 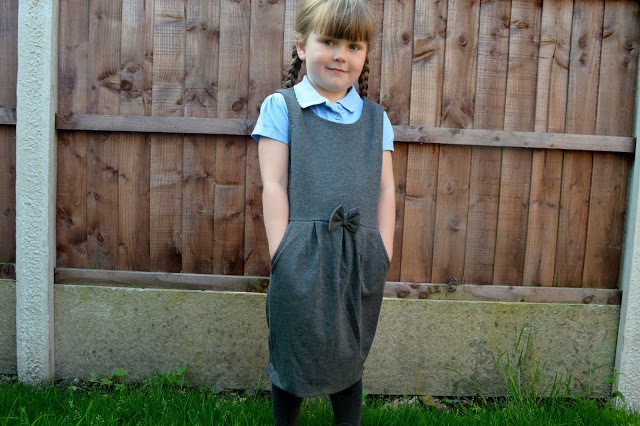 With that in mind I’ve bought her two new school dresses in a slightly different style. She’s completely in love with the skater pinafore dress as it spins out when she twirls, and what little girl wouldn’t love that? I particularly love the tulip dress and would quite like to wear that for work myself. I thought the heavy jersey would be really comfortable for her. I also loved the idea of the skort – no more flashing her knickers sat cross legged on the floor in these little beauties! At the moment she isn’t quite so keen but I think I’ll win her round! The little bow details on the pocket should help. Chloe has plenty of school t shirts after I had to buy her more at Christmas so I haven’t invested in any more of those for her. 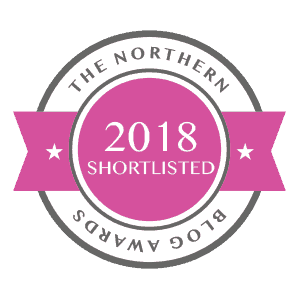 I also ordered a couple of new summer dresses in preparation for next summer – she loves that they come with a matching scrunchie! Her new dresses are all age 5-6, whilst Chloe has only just turned 4 she’s quite tall for her age and has been wearing age 4-5 clothes for a while now. 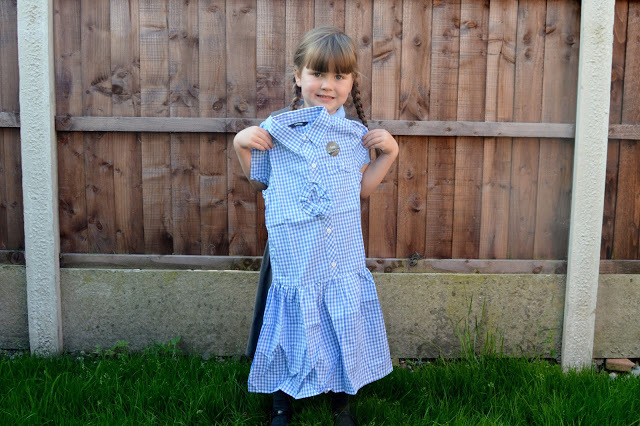 These dresses are certainly true to size, there’s plenty of growing room in her new school uniform from ASDA but she can certainly get away with wearing them now! In addition to the wide range of school uniform from Asda, they also have a huge selection of other back to school essentials including bags, lunch boxes and drinks bottles. Ben and Chloe both take a bottle of water to school each day (and either bring it home again full or just leave it behind so I’m not sure why we bother really but anyway . 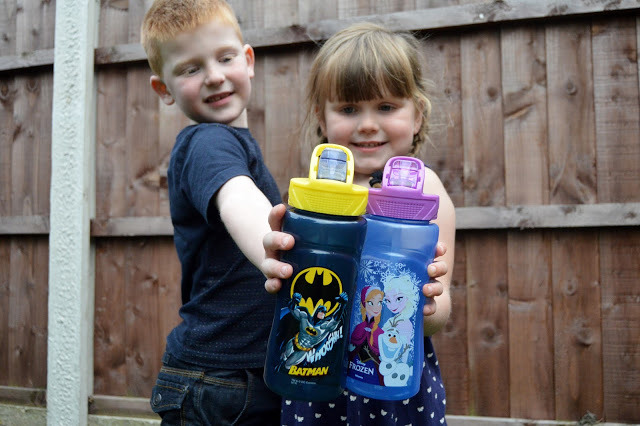 . . ) I’m hoping that with their gorgeous new Frozen & Batman bottles they will be a bit better at remembering them! I love the flip top feature and the handles for carrying them. Being dishwasher safe is of course always important for this sort of thing. 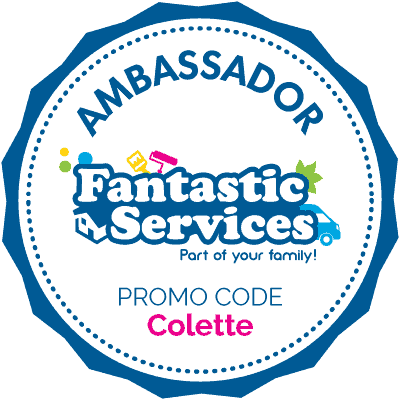 Their school clothes range is great, I still buy my secondary jumpers there and just sew on the school badge as they are a fraction of the price! Ben and Chloe look very pleased with their new uniform. You can't beat Asda for value for money! 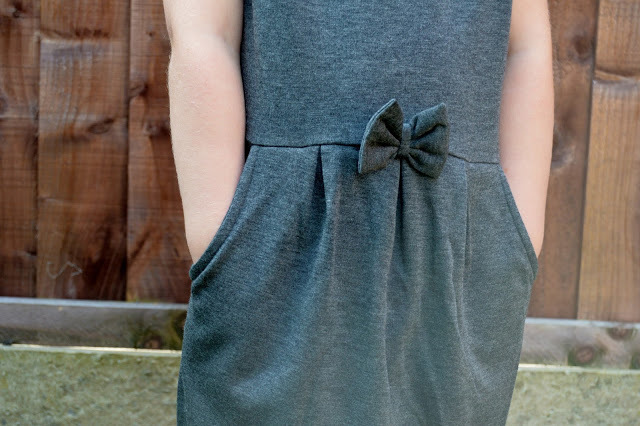 The bow detail on the dress is cute! 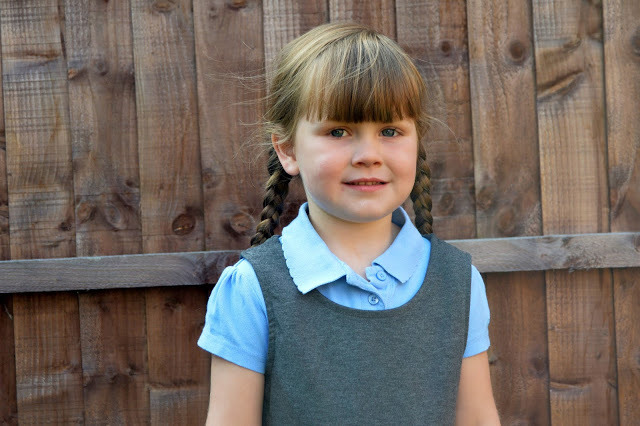 We buy most of Boo's uniform from Asda and have always been pleased with the range, quality and prices. They look really good quality, I am always so surprised by the quality of supermarket school uniform now. They look very sweet, I love the dress most! Aww! They both look very smart…. 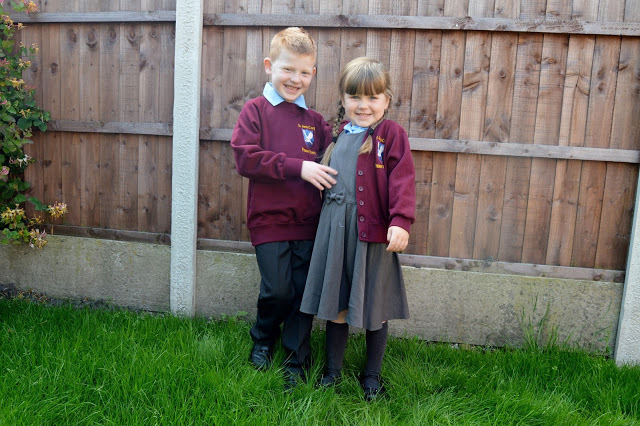 Aw they look so smart :), We have always used Asda for school uniforms before we started home schooling that is. They look really cute in the uniforms. I like the blue polo shirts as well – hopefully they'll not look grubby after a while like white ones can. Thank goodness I have another year before I face this! Ah, they both look very smart and the clothes good quality. I have been a little dubious about Asda clothing in the past but will check them out. Love that pinafore! I would have loved to wear that when I went to school! Great photos and thanks for hosting. This still semms a long way off for me (my boy is just 15 months), but I will bear this in mind in a few years time! They both look great in the uniform and it is fantastic value! 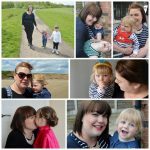 Asda children's clothes are always good quality in my experience too! 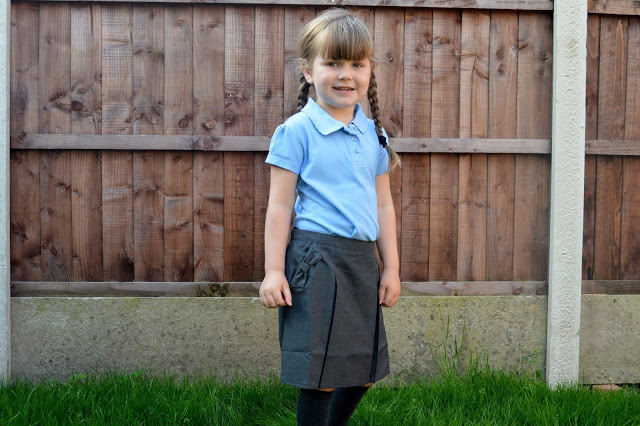 I love school uniform – always looks so cute =) Great photos it appears they like their uniforms too!